Extensive survey involves inspecting and documenting visible remains in the greater Elmalı region. It includes mapping the location, size, standing architecture and ceramic profile of published sites, locally-known but unpublished sites, and new sites discovered in the course of repeatedly traversing the network of local roads by means of motor transport, as well as expeditions on foot in areas where roads do not exist or are not passable. 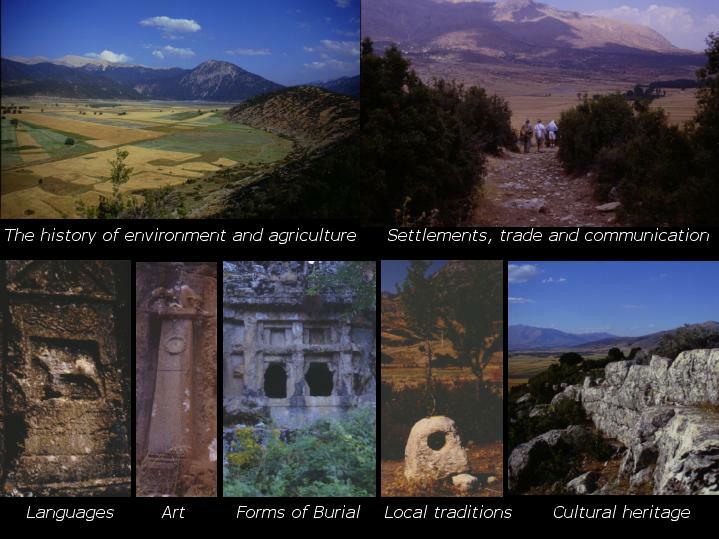 Extensive survey tends to find larger and better-preserved sites, as well as evidence for the road and communication networks that connected those larger sites. 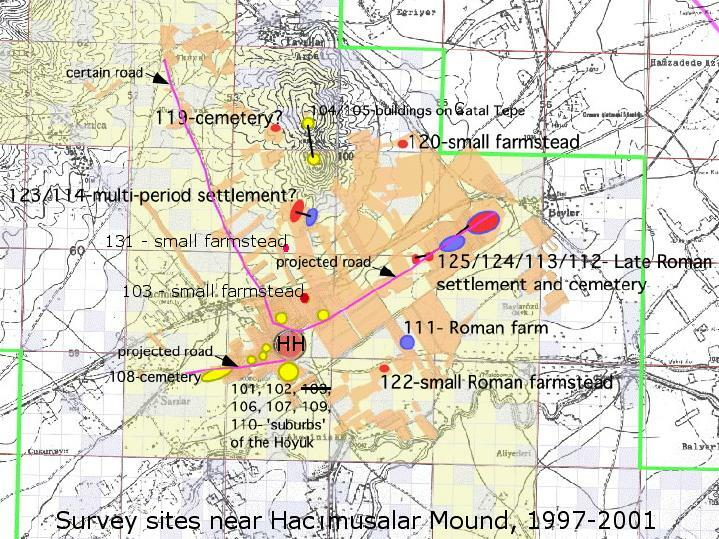 Intensive survey involves the systematic and total collection of all surface artifacts, and recording of surface features of human origin, in a sample of territory around Hacımusalar Höyük. Collection is done by transects, the courses of individual fieldwalkers usually spaced 10 m. apart. Decades of experimentation in Mediterranean survey have established that there is a correspondence between the distribution of artifacts aboveground, and evidence of human activity buried underground. 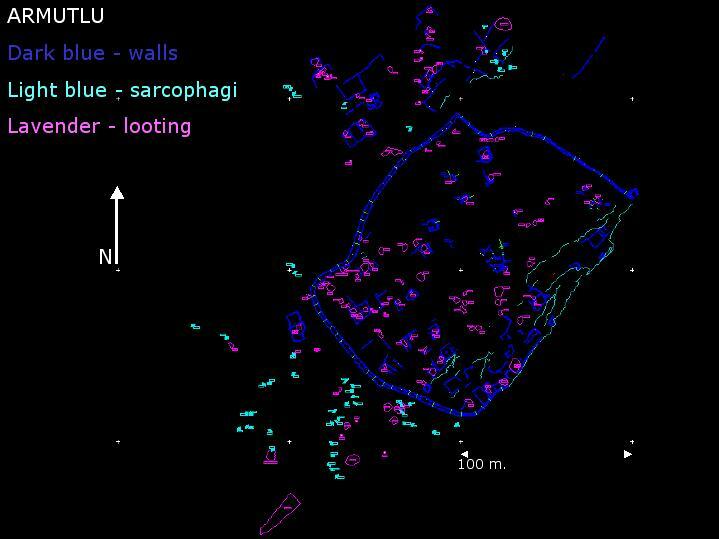 Intensive survey can therefore help reconstruct ancient settlement and activity patterns on a finer level than can extensive survey. Intensive survey can locate smaller and more ephemeral sites, and so a fuller range of human activity can be detected. The Hacımusalar intensive survey is carried out upon two overlapping geographic samples [see Fig. 1]: a deliberate 100% sample that includes the full range of topographic, geologic and climatic diversity in the basin (shaded yellow), and a random 20% sample that covers an expanded territory around the deliberate samples (shaded lavender), one which includes the nearest set of neighboring sites of comparable size to Hacımusalar Höyük (the red dot in the center of the basin). The set of red squares marks out a 1-km. grid. The sample covers a good part of the basin in between where two lakes used to exist before they were drained in the 1960s-70s (see Environmental Report). Remote sensing assists both survey strategies. 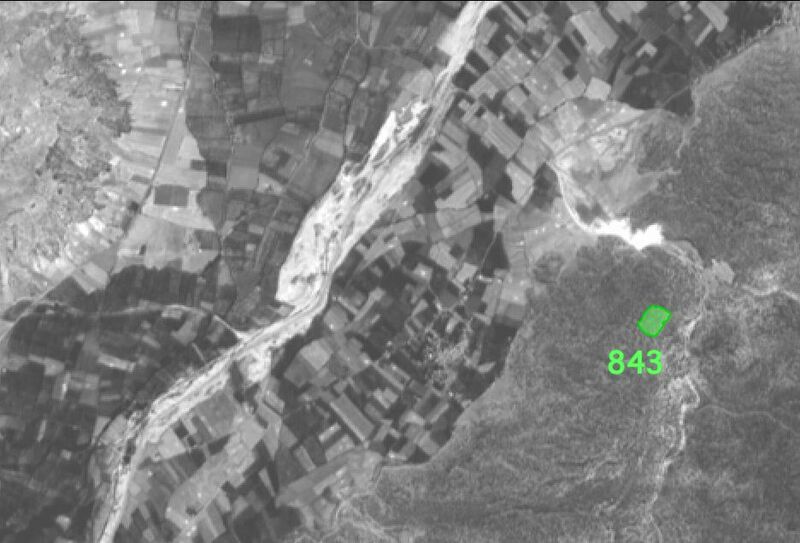 The acquisition of satellite imagery for the basin (a 10-m. SPOT panchromatic image) [e.g. see Fig. 2] provides a relatively detailed topographic context upon which various versions of archaeological maps may be overlain. We intend in future survey seasons to not only acquire additional satellite imagery (more detailed and also multispectral), but to use remote sensing on the surface: ground-penetrating radar (GPR), magnetometry and resistivity surveying. These geophysical techniques can often make visible patterns of sub-surface remains. Even if they provide definitive answers to questions about the nature of a site, these techniques often raise valuable issues which extend our research questions more deeply, and may even spur limited excavation of sites identified on the survey. 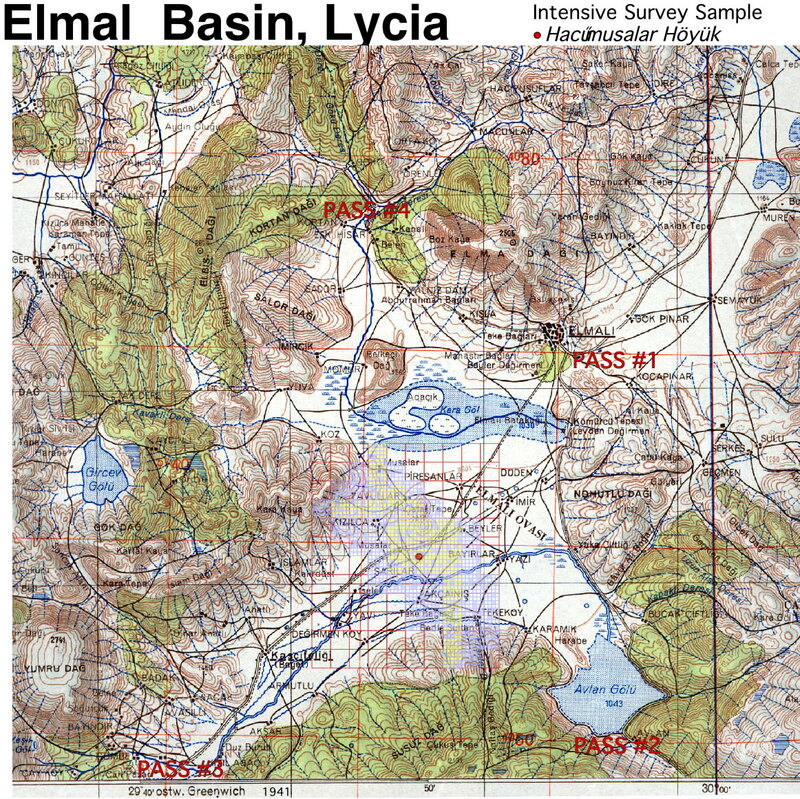 The survey is diachronic; it intends to study the entire history of human occupation in the Elmalı Basin. There are reports of paleolithic remains in the greater basin area (pers. comm, director of Karain Cave excavations), and we are interested in evidence from that time right down to the Ottoman period and early modern era (until World War II). In order to try and perceive historical patterns of the longue durée (centuries-long) and moyen durée (generational), as Fernand Braudel has described them, we cannot leave any period out of our analysis; any caesura would be detrimental to our long-term understanding of processes and events in the basin. A full explanation of our methodology is contained in the survey manual. The survey databases are currently kept in Filemaker Pro 5 format, but are being readied for conversion to access over the World Wide Web. These classes should be considered as preliminary, and with somewhat fluid boundaries. Classification is made through autopsy, collection of ceramics, architectural elements and small finds, and inspection of aerial imagery. The classes are not categorically consistent; they incorporate physical profile, topographic setting, and to some degree, function. Nevertheless, they are currently the best way to sort out what the various sites ‘look like’, and they help us sketch out an initial picture of settlement and activity patterns in the basin. The discussion below is limited to the Elmalı Basin south of the present town of Elmalı, though our interests and some of our preliminary investigations also lie in the Golova Basin just to the NE of Elmalı Town. Mounds in the basin are often constructed on local high points (even as low as a meter or so above the surroundings, perhaps to keep the settlement area a bit higher than ground that tends to flood or become waterlogged during the winter months). They are then built up through the successive construction, demolition and leveling of buildings made largely of mud-brick. Mounds can range from about a meter high (Pirhasanlar Höyük, site 849) to thirteen meters high (Hacımusalar Höyük, site 100). Height is not just a measure of duration of settlement, since both the mounds mentioned above have Bronze Age, Iron Age, Classical, Hellenistic and Roman ceramic evidence, but may be a combination of duration and intensity of settlement. More mounds tend to be located closer to the perimeter of the basin floor than in the center bottomlands per se. For instance, there is appears to be a ‘blank area’ in the eastern central part of the basin, near the course of the Akçay River, which runs SW to NE/E through the plain, probably because that area tended to flood. Mound settlements are also well-spaced; a handful of large mounds (Akçay Höyükler W & E in the SW [sites 803, 847], Hacımusalar Höyük in the center [site 100], Buralia Höyük in the SE [site 806], Yakaçiflik Höyük in the E [site 808], Elmalı Höyük in the NE [site 814] and the Eskihisar Höyükler in the far N [site 810]) dominate communication routes and must have had general control over the arable lands in their vicinity. We might be able to classify these as regional centers. The Early Bronze Age, Hellenistic and Roman periods are particularly well-represented, suggesting notable expansion of settlement off of the main mound during those periods. In addition, evidence for industrial manufacture (glass and metal smelting) and agricultural processing (imported basalt grinding stones) is heaviest amongst these suburbs [e.g., slag: Fig. 6]. It would be worth systematically investigating other mounds of size comparable to Hacımusalar in the area, to see if they also have a pattern of suburbs, or if Hacımusalar is unique in this regard. Between these regional centers, smaller mound settlements are in evidence (such as Tekke Höyük in the S [site 804], Pirhasanlar [site 849] and Eymir [site 800] Höyükler in the center, and Elmalı Town Höyük [site 825] at the NE pass). These smaller mounds have received little if no attention in previous studies of the basin, and we suspect that there may be more of these sort of local centers in the basin than currently known. Both Tekke and Pirhasanlar Höyükler were converted for use as burial grounds at the end of their settlement life; more intensive survey or even excavation would be necessary to determine whether there was any qualitative difference in the nature and function of the occupation at these local centers, as compared to the regional centers. Regardless of size or duration, these mounds must have exploited the rich agricultural soil of the basin bottom, the less-fertile alluvial basin slopes, the forested slopes of the high mountains, and the marshes, rivers and lakes that once existed here. They were complete communities, with habitation, food processing, manufacturing, some evidence of public centers, and cemeteries either on-site or in the vicinity. Populations may have ranged in small centers from 50-100 people, to hundreds or thousands for the regional centers. The nature and degree of their social and political organizations, their relations with other centers in the basin or with peoples outside the basin, are as yet unknown. Further research will also be necessary to assess the chronological ranges of these sites. At present, one large open settlement has been identified by the survey in the basin bottomlands, located approximately two kilometers NE of Hacımusalar Höyük, and within a hundred meters of the western edge of the present settlement of Beyler, on a low spur off the SE side of the hill of Çatal Tepe. It is designated a combination of sites 112, 113 and 124. This extensive site had some Middle Roman material, but contained mostly Late Roman (greater) and Byzantine (fewer) artefacts. Imported Greek marble revetment, architectural blocks, and a large spread of tile suggest many buildings, some quite well-appointed. Upon finding site 112, we at first thought we had discovered a large late-Roman villa, but additional concentrations soon made it clear that this site was too large for that. Older residents of Beyler recall seeing building walls in those fields within their memory, so it appears that only relatively recently the site has disappeared under heavy plowing. We suggest that as Hacımusalar Höyük shifted from being a settlement to being a church-center in the Late Roman period, some residents moved eastward to this site, which may then have become the ancestor of modern Beyler. This is only a preliminary hypothesis. This site was situated along an SW-NE communication route (roughly the course of the modern road, which traverses a rather low ridge across the center of the basin), and it is proximate to the cemetery site 125. 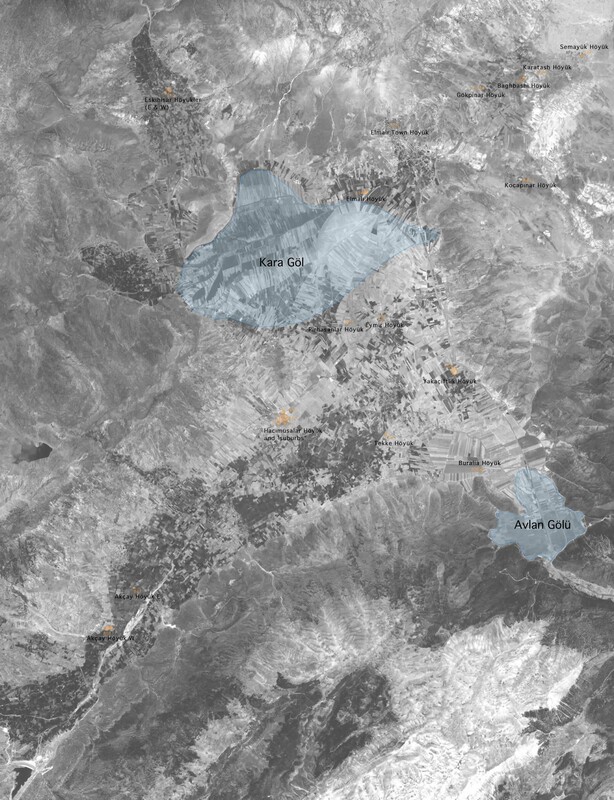 We hope to carry out some remote sensing operations here to further clarify the organization and nature of this settlement. In the northwestern part of the basin, along the west side of the north spur of Balıklar mountain [see Fig. 1], we have located a settlement along the lower edge of the basin and extending a short distance into the basin bottom. This is the site of Ördekbeli (site 839-841), at which we have recorded over a dozen sarcophagi (two carrying inscriptions of Roman Imperial date published by George Bean (Journeys in Northern Lycia 1965-1967, Titui Asiae Minoris nr. 4, Wien 1971, 23-25, nos.40-41), a sarcophagus quarry, numerous architectural blocks, and one carved relief. On the peak immediately east of the settlement (site 842) are apparently at least two robbed-out chamber tombs that may have been associated with the town. At least two roads (832, 835) reach this site, which appears to have been a crossroads at least during the Roman period, if not before. We have limited evidence for other open settlements in the basin bottom. East of the town of Eymir (site 837), a series of large limestone building blocks, some with architectural cuttings, were pulled out of the ground several years ago when a water pipeline was being laid at a depth of about two meters. To the west, local informants displayed architectural elements (now on display in the courtyard of the town mosque and at local residents [site 850]) which they reported came from a field over one kilometer to the northwest, where long column drums are still encountered every plowing season. These were not visible to us at the time of our visit there. Southeast of Elmalı Höyük (site 814), a large monolithic column now erected upside-down by the side of the dirt road into Elmalı (site 846) suggests a large monumental building in the vicinity. Finally, south of Ördekbeli above road 832 (see below), a large rectilinear building (site 833) sits on a leveled area; only the stone foundations survive, and no date has been determined for this settlement. We have found a number of small isolated sites throughout the survey area which appear to be distinct habitations, probably with an agricultural aspect. None of these sites has any appreciable topographic profile, and each would have remained archaeologically ‘invisible’ were it not for intensive fieldwalking. Two sites (120, 131) lie upon the lower slopes of the hill of Çatal Tepe, to the east and southwest, respectively. Both sites revealed a small area of concentrated pottery and especially of tiles (evidence of buildings), as well as fragments of storage jars. Material densities were not as high as on larger sites (see above), but stood out clearly from the minimal level of finds in the immediate area. Both sites appear to have been significantly damaged by plowing. Pottery for site 120 appears to be Hellenistic; the chronology for 131 also indicates a Hellenistic date, perhaps spreading into the Classical and Early Roman periods on either side. Closer to Hacımusalar Höyük, site 103 was originally thought to be a small suburb of the Mound, such as those described above. However, re-examination in 2001 identified many tiles, storage-jar fragments, flagstones, stone revetment, glass, chipped stone tools, a high concentration of basalt grinding-stones, a stamped amphora-handle (Hellenistic), and a single example of a round brick used commonly in the construction of pilae (short stacks of brick or tile used to support a raised, heated floor of the type found in Roman baths). The material profile of this site now more closely resembles the others in this category, and so we tentatively suggest that it was a particularly well-appointed residence that probably included a small private bath or heated room(s). A few pieces of pottery date to the Early Bronze Age (probably washed or moved from one of the nearby suburbs), but the clear majority are Hellenistic, into Early Roman (and perhaps Middle Roman). Further into the basin, to the south-east of the mound and resting at the edge of the 1045 m. a.s.l. elevation boundary are two additional sites, 111 and 122. 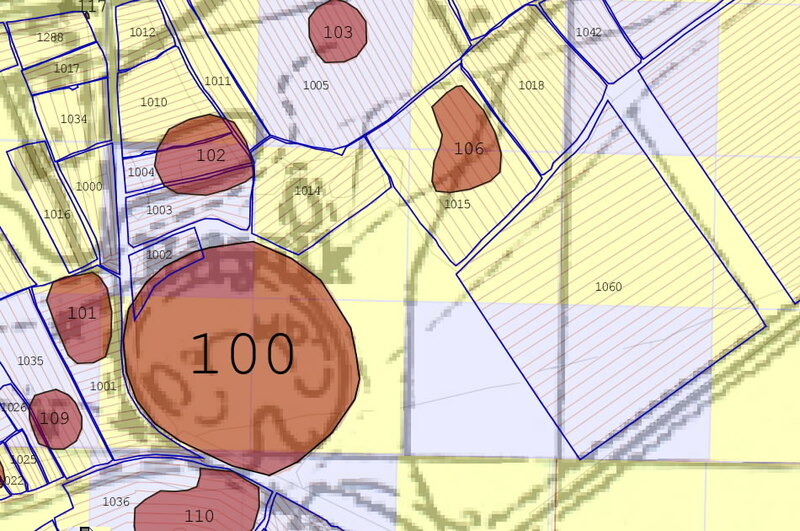 The former is easily the largest of the so-called farmsteads, although only half of the site has been walked intensively, the other half not having been harvested so far during the survey season, though close inspection has indicated rough boundaries for the site. At or near 122 were found a grinding stone and a pottery waster. Pottery from 111 is exclusively Late Roman and Byzantine; that from 122 also Late Roman, with possible extension into Middle Roman on the one hand, and Byzantine or even Ottoman on the other. At present, the pattern of small, isolated settlements appears to show earlier, smaller ‘farmsteads’ on higher ground, along the lower slopes of Çatal Tepe, and later, larger ‘farms’ further down in the basin. In fact, we do not have any concentration of finds (of any period) from anywhere else lower in elevation than sites 111 and 122. Such a shift in the location of small farm settlements towards the basin bottom may be due to overall changes in settlement pattern and density, local rules of land-tenure, or perhaps climatic changes (a drying-out of the basin in Late Antiquity? ); at present we do not have enough evidence to know for sure. But the pattern is intriguing, and additional survey we hope will clarify the questions we continue to ask and provide better data for our hypotheses. 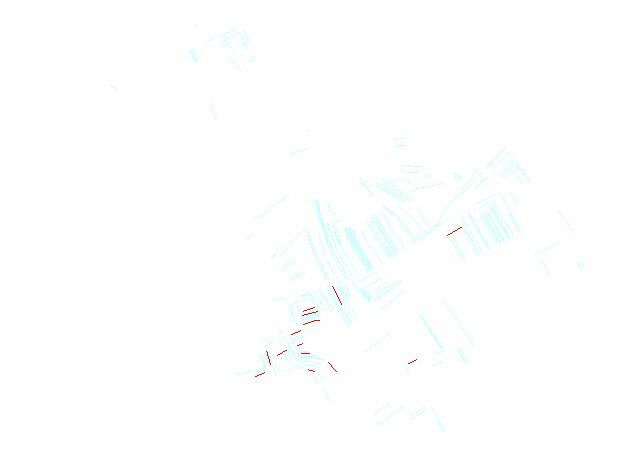 Finally, we have also been mapping all ‘antique’ (i.e. over 50 years old) wells in the basin (so far, sites 116, 118, 121, 126, 130, 132, 133). Most of these wells are stone-lined and have a depth of several meters, and are now partially filled-in or capped. They provided ground water for irrigation and for the transhumant animal flocks until the large lakes in the basin were drained, which has dropped the water table from less than 10 m. (seasonally variable) to over 30 m. deep. A full recording of these wells may help reconstruct premodern and early modern patterns of agricultural activity and transportation in the area. One of the prominent natural features of the center of the Elmalı Basin is the hill of Çatal Tepe, rising nearly 150 m. above the plain, with two peaks: the south and the north. It has a superb view of all parts of the basin, and several ancient (and modern) roads pass by the base of the hill. Its obvious strategic location alone suggests that it must have been used or occupied in antiquity, especially given its commanding view of Hacımusalar Höyük. However, the hill has a slightly different geology from the sides and floor of the basin, being composed of flysch and soft sandstone capped by a layer of conglomerate limestone. The friable nature of the bedrock has led to severe erosion; recently in fact the Turkish Forestry Service terraced the upper slopes with bulldozers, in order to plant evergreen trees to control erosion. A large dug shaft (illegal excavation) on the east side of the south peak shows that the level of eroded sediments reaches several meters deep on the slopes. For these geomorphological reasons, no successful identifications have been made of settlements or activity on this hill until now. The survey has now located a site on each of the two peaks of the hill. Site 105 on the heavily bulldozed north peak consists of a wall-course, preserved in several sections and possible rock-cuttings, double-faced and constructed of local stone, roughly cut and fit in dry construction. Up to 1.5 m. wide, it may be a terrace-wall or a fortification wall. A few worn sherds have been collected which may be Roman in date. On the south peak, site 104 denotes the ruined piles of several adjacent structures near the peak, which also has a türbe, or shrine-site often associated with the burial-place of a local holy man. More ceramics have been recovered from this peak, with pottery belonging to the Early Bronze Age and the Classical?-Hellenistic period. The türbe also indicates Ottoman use. Evidence for more extensive and elaborate activity on this hill come from several other places. A fragment of a limestone moulding (Hellenistic-Roman in date) was found at the top of field 1240 [see Fig. 3] at the southeast corner of the hill, and this suggests some visible monument further up the slope that underwent damage and disintegration, whether public, private, or funerary in nature. 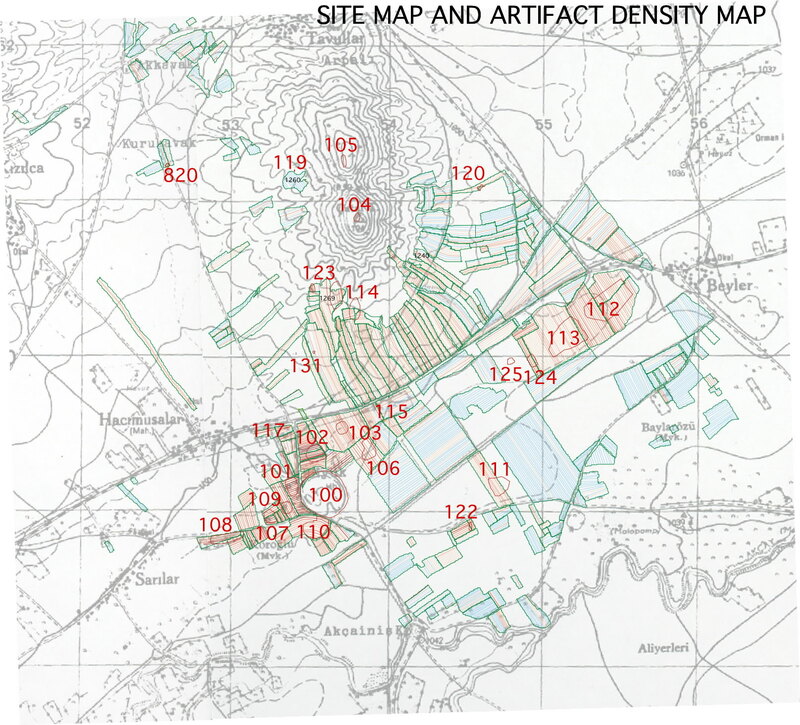 Near the southwest corner of Çatal Tepe, heavy concentrations of pottery have led to the designation of site 114 (eastern portion)-123 (western portion). Some of the material found here on a spur of the hill, with a tremendous view of Hacımusalar Höyük, may have eroded from further up the slope; we are in the process of trying to locate the limits of the site and determine the ultimate origin of the material. A great range of ceramics have been recovered: Early Bronze Age in field 1269 and Late (even Early?) Iron Age-Classical on both sides, with evidence continuously into the Middle Roman period. Pottery tends to appear in larger pieces here, since only part of the area is under cultivation, suggesting an extensive and reasonably well-preserved settlement, albeit heavily buried by erosional deposits. This is a promising site. Finally, site 119 around the west slopes of Çatal Tepe was an isolated find: several large pieces of several bichrome pots (Late Iron Age-Classical in date), which had the initial appearance of burial jars for cremations. The use of the hill as a cemetery has long been suspected, but we as yet lack definitive evidence (e.g., skeletal remains). We do know that there was settlement on the hill — loom weights and other domestic artifacts attest to that. The presence also of burial areas is not out of the question, and I suspect is quite likely. We shall continue to search. A series of fortified and unfortified settlements ring the basin, atop the lower peaks and ridges of the surrounding mountains. While several (such as Armutlu, Buralia and Gilevgi) have been known since the nineteenth century, the only significant attempt to study them was made by Martin Harrison (whose work is now summarized in: M. Harrison Mountain and plain, ed. by W. Young, University of Michigan Press 2001, ch.3: The Elmalı Plateau and its mountains, pp. 48-60). Harrison is particularly interested in the Late Roman and Early Byzantine periods, and his study of the mountain town and fortress at OvacIk (our site 856), about 45 km. east of Elmalı, was his most extensive work in the Elmalı region per se. Harrison also mentions the well-preserved fortress atop the peak at Gilevgi (site 861), which guards the northeast pass into the Gölova and Elmalı basins, a fortified site above and between Elmalı and Bayindir (which we have not yet been able to re-locate), and two sites that our survey has looked at in some detail: Podalia/Buralia (site 805, 807), and Armutlu (site 843). The site of Buralia (805, 807) exists in three parts, at the location of a steep ridge set off from the main mass of mountains at the northwest corner of the now-drained Avlan Gölü, in the southeast corner of the Elmalı Basin [see Fig. 9]. Just off of the north tip of this ridge lies site 806, the Buralia Mound. Atop the north portion of the ridge is a fortified site with a substantial curtain wall of fine squared masonry, which appears to be of Hellenistic date. The ruined outlines of several large structures are apparent at the highest point inside this circuit, but no map has as yet been made of the place, and our survey has been able to make only a few reconnaissance visits, one of which found, however, a fragment of a carved stone moulding near the summit, which bespeaks buildings of not strictly a functional nature on the ridge proper. At the bottom edge of the ridge, along the north and northeast edges is another site (807), which we are calling the ‘lower town’, and where numerous and massive building blocks are visible, most of them moved by farmers to the stone piles that mark the boundaries of their fields. We have recorded part of a fluted column and other decorated blocks here. This new archaeological evidence may resolve a running controversy about the identity of this site. Numismatic and literary records mention two primary sites within the Elmalı Basin: Choma (which we now know is Hacımusalar Höyük, site 100), and Podalia, during the Roman period. Podalia has never been securely identified by in-situ epigraphic finds, though the recently-discovered ‘Stadiasmus Provinciae Lyciae’ inscription at Patara should shed some light on the issue when it is finally published. Preliminary reports of that inscription (see: S. Bulut and N. Coshkun, ‘Yol Kilavuz Aniti’ in F. Ishik, “Patara 1994”, Kazi Sonuçlari Toplantisi 17.2 [Ankara 1995] 161-164), which is of Claudian date, indicate that Podalia is mentioned as the starting point of one road to Idebessos, located near the head of the Alakir River valley to the east. This is a reasonable route if Podalia was located at the ridge of Buralia. Most scholars (pace Bean) now agree that Podalia was Buralia. Our research suggests that the main settlement was located not on top of the ridge, where the fortification was, but along the bottom edge on the northeast side (site 807), protected by the fort in back, but facing forward into the plain which allowed this settlement to flourish at the gateway of the shortest route from the basin to the seacoast. At some later time, a land route which skirts the western edge of the lake was given additional protection at the low saddle which connects the Buralia ridge to the main mass of the Susüz Mountains to the west. This site (848) consists of an enclosure of large irregular dry-laid stones (and walls at least one meter thick) with one main interior partition and two entrances. By appearance (after a brief initial visit this year) we postulate that it is of Byzantine or later date. The other major montane settlement that has received scholarly attention is Armutlu (site 843), located along a ridge towards the southwest corner of the basin [see Fig. 9]. The site guards a pass into the mountains towards the south, as well as approaches into the center of the basin from the southwest [see Fig. 10]. This site consists of a settlement enclosed by a rectilinear perimeter wall about 165 x 200 m. in size [see Fig. 11]. Inside the walls, we have begun to identify individual buildings and streets, and a cistern amongst the rubble remains of the walls, which were founded upon bedrock. Around the slopes on the southwest and northwest sides of the walls are over 40 sarcophagi, several of them decorated with reliefs. Across the site are also over 120 looting sites, which reveal the sad damage that is being done each year to the site by looters. Walls and foundations are disturbed; graves are robbed, pits are dug, and the site is unsecured, so that other than our work, there is no report of or protection for the archaeology that still survives there. Ceramic evidence, funerary reliefs and architectural blocks from Armutlu suggest occupation from the Hellenistic period into the Byzantine period. We shall continue our mapping of the walls, buildings, terraces and tombs until we have a complete map of the settlement, and then plan to undertake an examination of what evidence we can find for dating and phasing of the site. A good overview of the site and its problems can be had by viewing a digital video made by DePauw student Rose Silpayamanant during the 2001 season. Two other sites occupy high positions along the northwestern line of mountains: Islamlar (site 823), and Eren Tepe at Mursal (site 809). The former [see Fig. 9] sits along a ridge above and to the northeast of the modern village of Islamlar. Several decorated sarcophagi, rock-cut tombs with inscriptions and buildings constructed of fine ashlar limestone blocks (the largest appears to be either a temple or a heroön) occupy the site. Our team has made one visit to the site; future visits will be necessary to investigate systematically and properly. The site appears to have evidence for the Hellenistic- and Roman-period use. 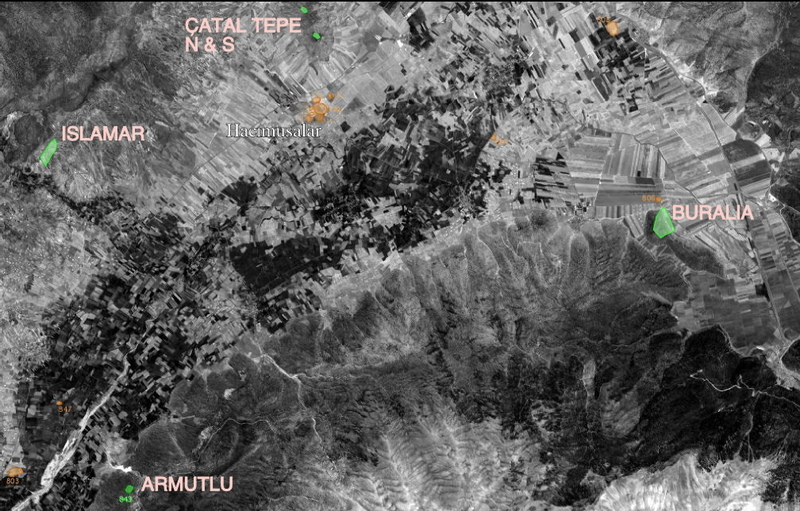 Mursal is located north of Çatal Tepe, at the northern edge of the intensive survey sample [see Fig. 1]. On a rocky conical hill above the modern village are numerous rock cuttings: some appear to have been used for buildings, others were platforms for sarcophagi. On the lower southwestern slopes of the hill there is evidence for a later burial ground. As with Islamar and Buralia, we have only made preliminary visits here, and the site is on our list for a detailed plan and sherding. Near the north edge of the basin, the rocky hill above the modern village of Eskihisar (site 811) also has rock-cut tombs, this time of the Lycian house/granary type, carved into the cliff-side, as well as cuttings on the top of the rock itself. These tombs have long been known, but the site itself, along with another enclosed site on a hill just south of the town (which we have not yet visited) has not received any concerted attention. The survey has thus far not carried out a systematic study of these burial locations and types, but an overview of the evidence can be given as follows. We have evidence for fields of sarcophagi, rock-cut and chamber tombs around several settlements: sarcophagi at Ördekbeli (site 839-842), rock-cuttings for sarcophagi on Eren Tepe at Mursal (site 809), rock-cut tombs in the cliffside at Eskihisar Village (site 811), sarcophagi and rock-cut tombs in the mountainside at Armutlu village (site 844-845), sarcophagi and pit burials around the fortified site above Armutlu (site 843), and both rock-cut tombs and sarcophagi at Islamlar (site 823). At several sites where we might expect to see such burial grounds, evidence has not been forthcoming, such as Yakaçiftlik (site 808), Buralia (site 805-807), Tekke (site 804) and Akçay (sites 803, 847). Most of the known cemeteries appear near places classified as ‘montane settlements’, those apparently lacking peripheral burial grounds are ‘mound settlements’ (see above). At least, such is the evidence for the Roman period, to which these more durable rock-cut cemeteries belong. At mound settlements where no cliff-sides or bedrock was conveniently available, there may have been different (and less visible) kinds of burials around the site, or burial may have taken place at locations well away from the settlement. In the Early Bronze Age, at least at Karatash- Baghbashi (sites 853-860), a cemetery containing pithoi burials was located just off of the main habitation site. For the Iron Age, an extensive cemetery of rock-pile tumuli has been excavated at the present town of Bayindir (site 818), though no associated settlement has yet been located. According to the present excavations, the Hacımusalar Höyük (site 100) was used as a burial ground around the cathedral there as settlement itself may have waned or moved elsewhere. The same pattern is evident at two smaller mounds: Eymir Höyük (site 800) and Pirhasanlar Höyük (site 849), both to the northeast of the mound [see Fig. 2]. In the Gölova Basin, a mound at Semayük (site 854) is attested by Mellink to contain an active cemetery; the same is true for Soghle (site 817) and Kocapınar (site 815). Site 108, the SarIlar Cemetery located along a dirt road leading west from Hacımusalar Höyük, is presently fenced off, and is still being used for burials in its westernmost end. Cist burials and evidence of a large stone monumental building (in the form of numerous architectural blocks) are present near the center of the site, and burials even continue for several meters outside the fence into a field to the east. The site probably also extended to the south, where numerous sherds were recovered in field 1030. Ceramics date largely to the Late Roman period, with possible use in the Early Roman period; use of the site almost certainly continued into the Byzantine period, judging by the carved architectural elements, and indeed into the Ottoman period. Thus this site seems to have had continuous use as a cemetery since the Late Roman period (which is also true of other sites, such as 800). A preliminary look at the architectural blocks suggests a Late Roman to Byzantine date for the structure, which has the appearance of a basilica or church, based on comparison to the remains recovered from the Byzantine cathedral currently being excavated on Hacımusalar Höyük. A Christian cemetery would then be expected to exist around such a building. A close survey of all the blocks as well as geophysical prospection would likely provide much more detail about the layout of the site. Communication routes and prominent hills were popular locations for sarcophagi, rock-cut tombs, rock-pile tumuli, tumuli over chamber-tombs, and vertically-dug chamber tombs. All these types tend to remain in situ, except sarcophagi, which have often been moved into farmyards to serve as water troughs, taken to the edges of fields so as not to damage farm machinery, or moved to the courtyards of village mosques for decoration or as flower planters. We have reconstructed ancient roads in part based on the presence of such sarcophagi (both in and [we assume] near the roads); see the section below. Sarcophagus fragments at sites 115, 117, 125 and 128 suggest routes leading both east and north of Hacımusalar Höyük; another sarcophagus fragment (seen but not yet numbered at recorded) exists in the town of Sarılar, west of the Mound. Sarcophagi also mark roads in the north of the basin near Ördekbeli (sites 839-841), and west of Armutlu village (sites 844-845). Marked but as yet undatable cist cemeteries also appear alongside roads: on the low slope north of and below Eren Tepe at Mursal (site 809), and alongside the Ovacık Minor road between Geçmen and Buralia (road 829). Tumuli and tumuli covering chamber tombs are also sited alongside roads, such as the burial fields along the ancient roads east of Elmalı, at sites 826 and 857, above the Ördekbeli Saddle road (site 842), and a possible tumulus at Kurukavak near the apex of the Çatal Tepe saddle road (site 820). Tumuli also appear in prominent geographical locations, such as the crest of low ridges and hills above the basin: the famous painted chamber tombs excavated by Mellink at Kızıbel (site 812) and Karaburun (site 859), the chamber tomb and possible tumulus at Ada Tepe, in the saddle between Balıklar Dagh and Elmalı Dagh (site 813), currently being studied by Bob Bridges, the Geçmen Tumuli (site 816) just north of the town of that name, the Ardiç Tumulus (site 819) west of Bayindir, and the Mughren Tepe tumulus-chamber tomb (as yet unvisited and unnumbered). All of these locations have commanding views of different parts of the basin, and presumably marked the internments of local élites. What dates we have for such tumuli range from the Iron Age into the Hellenistic period. Finally, there are the Lycian-style tombs cut into the cliff-face above Kızılca, containing the one known Lycian-language inscription in the Elmalı region (G. Bean, Journeys in Northern Lycia 1965-1967, Titui Asiae Minoris nr. 4, Wien 1971, 22-23, no.38), as yet unvisited and unnumbered by our survey. Milestone found at Tekke (near site 804): G. Bean and M. Harrison, “Choma in Lycia,” Journal of Roman Studies LVII (1967), 44, no.11. Some of the roads have well-preserved stretches of stone paving, with curbs, up to 3 meters wide (roads 822, 824, 827, 828, 829, 831 , 832). Other roads can be located by virtue of their topographical profile: a linear track, often incised below ground level, with rows of trees or bushes along either or both sides, sometimes marked as well by low walls of stone (roads 821, 835). That same topographical profile is also present for the well-preserved roads, both where the road remains intact, and in places where it clearly runs, but the surface has been eroded away, or a modern road runs over the top of it. These roads run along the lower edge of the mountains around the periphery of the basin and over low montane passes connecting different parts of the basin, and would have remained dry (excepting perhaps road 832, which in several places is quite near the basin bottom) at all time of the year. There must also have been other thoroughfares that ran through the basin bottom, as evidenced by the Tekke milestone, and by the appearance of sarcophagi in stretches east, north, and west of Hacımusalar Höyük, for instance (see above). While the milestone dates to the mid-4th c. AD (Constantine the Great and his three sons), none of the roads have been securely dated, though we often (and perhaps too easily) assume that they at least existed during the Roman period. A careful program of study and comparison with known dated roads and road construction techniques from the Classical through Ottoman periods will be required before we can create a set of reliable road maps. In any case, whenever respective routes were first used or first improved, they were likely used for all periods thereafter. Personal communication with an elderly local in the town of Tavullar, at the northern foot of Çatal Tepe, revealed that road 822 was still the main north-south course in use in that part of the basin during the years after the Second World War. In terms of really understanding the nature and distribution of settlement in the Elmalı Basin in all period of history, we are only at the ‘end of the beginning’. No doubt many of our current hypotheses will change as we accumulate more and better evidence. At times, the task seems almost too large. However, a look back at our progress so far is heartening, and we can also be confident that even if we do not locate all or nearly all of the sites in the area, we will have precisely located (with the help of GPS) and mapped those sites we have identified. As excavations on the Mound proceed and our understanding of the local pottery chronology becomes more refined, we will also be able to view patterns in our evidence and the nature of transitions between those patterns more clearly. Stay tuned. Finally, as this document serves as the first widely-distributed summary publication of the survey data, we welcome any corrections or suggestions for improvement (please use the e-mail address at the head of the page). We plan to improve and supplement this document with additional maps and images, as well as additional bibliography. The creation date of this version of the document (1a) is 7 October, 2001.